bologna and pepperoni as it is too poor quality to be used in anything but the highly spiced meats. Sow biting the bars of her cage – a behaviour associated to frustration and boredom. The life of a sow is one filled with misery, deprivation, chronic frustration and heartache. More than 1.1 million sows are kept in Canada, with about 318,000 in Manitoba, 341,900 in Ontario and 319,000 in Quebec. The majority of these live all of their adult lives in barren, metal-barred cages 2 feet by 7 feet. 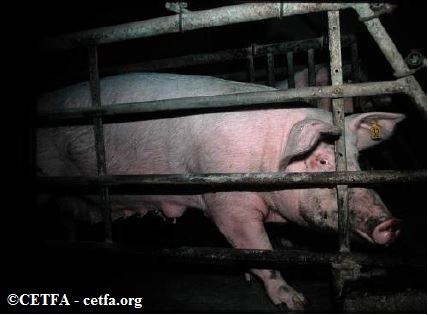 These “gestation crates” are so small that the sow cannot turn around. barren slatted concrete, no straw, and her waste falls between the slats into a pool of raw sewage beneath her. Her and her barn mates will be forced to breathe in this toxic waste all of their lives, 24 hours a day. And things are only getting worse: because of selective breeding, sows are becoming larger faster, meaning many are so large that their sides permanently rub on the bars along the sides of the crate, causing pressure wounds and near immobilization. 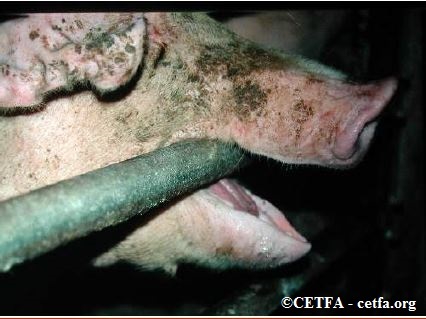 Often in order to lay down a sow must extend her legs into the pen of the sow beside her risking crushing injuries from her neighbour lying on her legs. For a sow with arthritis, this pain must be excruciating. birth, the sow is moved to a “farrowing crate” – a cage just as barren that will keep her separated from her piglets but still allow them to nurse off her. Because sows have been genetically selected for ever larger litters, most give birth to more piglets than they have teats to nurse from. The pig industry’s solution isto “PAC” the 1-2 smaller piglets, called “shakers”. PACing is an industry term meaning Pounded Against Concrete. The piglet is grabbed by the rear legs and has its head smashed into the concrete. This is routinely done in front of the helpless mother. Our inspectors have documented the practice and recorded it straight across Canada. Frequently, the piglets are not PACed properly and remain alive, suffering in the large rendering bins where they are thrown with literally hundreds of other piglets. One rendering company in Ontario has even had to send letters to Ontario Pork producers reminding them to please ensure piglets are dead before disposing of them. 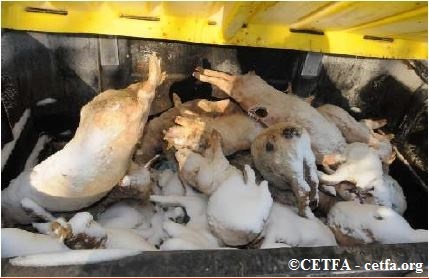 Rendering companies conduct pick-ups only once a week meaning these piglets were left suffering for many days. Because of their intensive, prolonged confinement, sows are in a particularly health compromised state by the time they are transported to slaughter. Approximately 80% suffer from some form of bone or joint problem such as arthritis, which fuses the bones in the legs together causing extreme pain and lameness, and fractures of the hips and legs. Many develop mastitis in one or more teats – a painful infection that causes inflammation and tenderness. Because of selective breeding, their bodies grow too quickly for their hearts to keep up, causing them to be prone to severe respiratory distress and heart failure. A sow’s first exposure to fresh air is generally only on the day she is sent to a collecting station, where she will be unloaded with electric prods, regrouped with pigs she does not know and reloaded onto another trailer with electric prods. She will have gone from a temperature controlled air conditioned or heated barn to whatever the temperature happens to be that day – anywhere from 35°C to -45°C with no provisions made for her – no water, no food, no protection from the sun between the slats in the trailer burning her skin or from the icy cold steel she is pressed against (sometimes causing sows to freeze to the sides of the trailer, particularly if she is still lactating – a major problem in Canada). Sow brought to auction suffering from severe ascites due to congestive heart failure. she will have to withstand an average of 10 additional hours until she finally reaches her destination. But, as our investigations have uncovered, this may not be her final destination either. We’ve documented cull sows from Canada sent to collecting stations in the States, only to be further regrouped and sent once again on their way, sometimes as far south as Texas. Alternatives to sow stalls exist and are in use in many countries. Group housing on straw is the simplest model and one that’s been around for hundreds of years. It allows groups of pregnant sows to freely walk around, root and create nests. A middle-ground is also available, where the pens are available to the sows for feeding time but with a bump of her rear, are unlatched to allow her the freedom to return to the open area with her barn-mates. Studies contrasting the systems have shown improvements to the sow’s physical and mental state as well as less lameness and culling due to injury and disease in the non-sow-stall systems. Sow in a gestation crate. 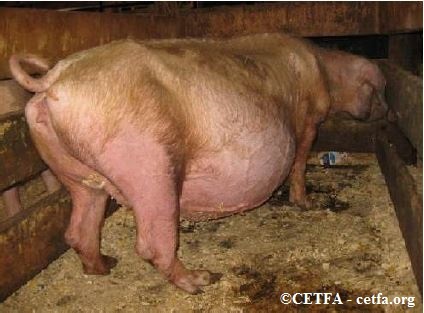 Sow stalls are already banned in many countries, including in countries belonging to the European Union. In the United States, numerous states have banned their use, including Michigan who banned the use of ALL intensive confinement systems (including veal crates and battery cages for egg-laying hens). While Canada is lagging far behind, there are signs that things are changing, and that sow-stalls will eventually be phased-out in Canada. For instance, in 2013, the Retail Council of Canada and its member grocers (Co-op Atlantic, Canada Safeway, Costco Wholesale Canada, Federated Co-operatives Limited, Loblaw Companies Limited, Metro Inc., Sobeys Inc., and Walmart Canada Corp.) announced that they agree to phase out the use of sow stalls by their pork suppliers in favor of “alternative housing practices” by 2022. However, 2022 is a long time to wait for the animals, and CETFA has been campaigning for a phase out date of 2017. In 2014, the revised Canadian pig code of practice was released. The Updated code requires that sows be housed in groups – with separate space for eating, sleeping, and eliminating – in all facilities built or rebuilt after July 1, 2014. This requirement may positively impact the welfare of hundreds of thousands of animals. While the code still allows the use of individual pens or stalls by July 1, 2024, since stalls have a life of 15 to 20 years, many additional facilities should have transitioned away, or be close to transitioning away, from crates by that date (although some could be in used up until 2033 if they were built or rebuilt last year!). Eventually, this new requirement should effectively lead to the full adoption of group housing systems by the pig industry. However, given the suffering endured by sows in gestation crates, and the fact that the public has been demanding the phase-out of sow stalls for many years, the phase-out period allowed by the new code seems unreasonably distant. We can only hope that the commitment of Maple Leaf to phase out gestation crates by 2017, as well as the one from all eight of Canada’s leading retailers to phase them out by 2022 and the bans happening in other countries, will help accelerate the transition to less cruel housing systems for sows. In the meantime, it is important that the Canadian public continue to make their voices heard and demand an end to these cruel and unnecessary confinement systems. Furthermore, it is crucial that everyone concerned with this issue vote with their pocketbook by buying only certified humanely raised pork products or refusing to buy pork products altogether until the industry reforms its cruel ways.